Hungarian master BÃ©la Tarr might be between movies or, for all we know, retired from filmmaking altogether but that's not stopping the filmmaker from participating in the world of film. Tarr previously mentored LÃ¡szlÃ³ Nemes, the Oscar winning director of last year's devastating and brilliant Son of Saul and now he's at it again, this time with his latest protÃ©gÃ© Emma Rozanski. A stranger, Tasya, arrives in Sarajevo and barges into Damir's reclusive world. Little by little she takes over his life, even absorbing his dreams, until finally she threaten his very existence. Damir cannot summon the courage to confront Tasya as she becomes progressively more comfortable and controlling. Can Damir find it in himself to struggle out of this trap and regain control of his life, or will Tasya take him over completely, leaving no trace of Damir in the world? The first clip from the movie sheds a tiny bit of light on the drama that will unfold between Damir and Tasya; she is clearly a force to be reckoned with and I'm curious to see just how far she pushes Damir before he fights back. 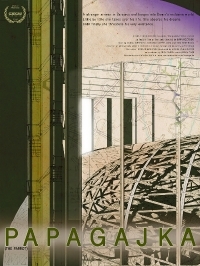 Papagajka is currently playing the festival circuit.